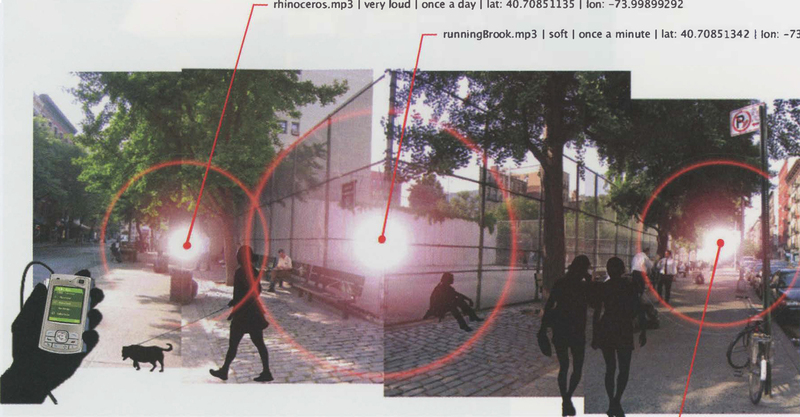 soundscape onto a specific urban space. Wearing headphones connected to a WiFi-enabled device, participants drift though virtual sound gardens as they move through the city. Where the presence of 802.11 access nodes is minimal, gardens simply consist of plantings along a sidewalk. Where node density is greater, gardens could assume the scale of a neighborhood. In cities where wireless networks are ubiquitous, gardens could extend throughout the entire city. The TSG Toolkit is a parasitic technology. It feeds on the propagation of WiFi access points in urban environments as a free, ready-made, locative infrastructure. WiFi access points used to determine the location of a participant may be open or encrypted, and need not be “owned” by those deploying the system. As the hardware component of the infrastructure is tied to the propagation of WiFi networks, the extent of the gardens is cast in a parasitical relationship to that of a specific wireless protocol. For location-based services, the project builds on Placelab (www.placelab.org), an open source, privacy-observant location system developed by Intel Research, Seattle. The system samples WiFi node signal strengths over the geographical limits of a specific location and stores them in a database. Placelab-enabled devices compare signal samples taken within a given location with the database of radiometric signatures and, through a process of triangulation, calculate the geographical position of the participant. This positioning information is fed to a listener object within a 3D sound engine running on the mobile device, which then outputs a real-time audio mix based on the position of the participant within the physical location.